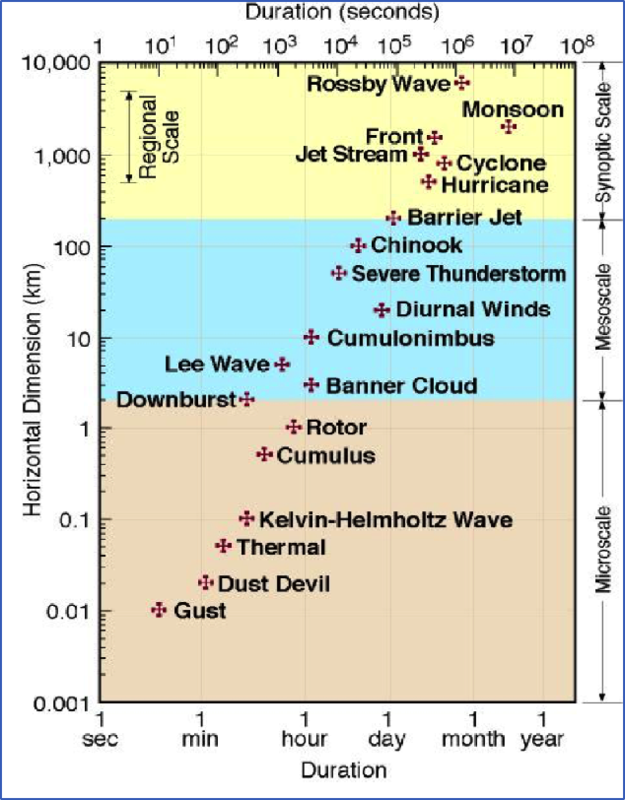 This graphic of different winds shows generally the source elevation and duration of different general (synoptic), local (mesoscale), and gust (microscale) winds. Critical winds dominate the fire environment and easily override local wind influences. Examples include frontal winds, Foehn winds, thunderstorm winds, whirlwinds, surfacing or low-level jets (reverse wind profiles), and glacier winds. Synoptic scale, gradient, free air, ridgetop are large-scale winds produced by broad scale pressure gradients between high- and low-pressure systems. They may be influenced and modified considerably in the lower atmosphere by terrain and vegetative structure. Thermal, convective, drainage, and convective winds are all caused by local temperature differences generated over a comparatively small area by local terrain and weather. They differ from those which would be appropriate to the general pressure pattern in that they are limited to near surface and are controlled by the strength of the daily solar cycle. Slope Winds are driven by heat exchange at the slope surface. They can react quickly to insolation on the slope, with upslope breezes starting within a few minutes. The strength of upslope winds is also influenced by the length and steepness of the slope as well as the exposure. Upslope winds generally range from 3-8mph. The transition from upslope to downslope wind begins soon after the first slopes go into afternoon shadow and cooling of the surface begins. In individual draws and on slopes going into shadow, the transition period consists of (1) dying of the upslope wind, (2) a period of relative calm, and (3) gentle laminar flow downslope. Downslope winds are very shallow and of a slower speed than upslope winds, generally 2-5mph. The cooled denser air is stable and the downslope flow, therefore, tends to be laminar. Valley Winds are similar to and linked with slope winds. Their development each day generally lags 1-3 hours behind that of slope winds. Peak speeds can be as much as double those of slope winds, reaching 10-15mph at their peak. Land and Sea Breeze Circulations during the day, sea/lake breeze can reach 10-15mph at the peak of solar heating in the afternoon. The corresponding land breeze is lighter, perhaps 5-10mph. Measured near the earth’s surface, at an observing station, customarily at some height (usually 20 feet or 10 meters) above the average vegetative surface and a distance equal to at least 10 times the height of any obstruction to minimize the distorting effects of local obstacles and terrain. Wind Gust is a sudden, brief increase in speed of the wind. According to U.S. weather observing practice, gusts are reported when the peak wind speed reaches at least 16 knots and the variation in wind speed between the peaks and lulls is at least 9 knots. The duration of a gust is usually less than 20 seconds. Midflame Wind Speed is the estimated wind speed at a height above the surface fuel equivalent to the height at midflame. This is the wind input required for estimating fire spread using the Rothermel surface fire model. It is generally derived from the Surface (20 feet) Wind based on sheltering from an upper canopy or flame height based on fuel bed depth. 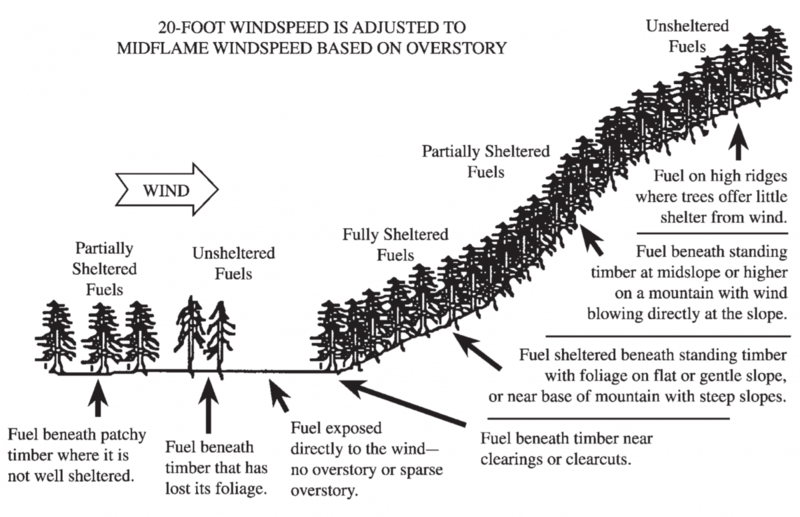 Eye-Level Winds are frequently used to represent midflame wind speeds, though that may represent an overestimate for shallow and sparse fuelbeds that have lower flame heights or an underestimate for shrub and crown fuels with deep fuelbeds. Effective wind speed is the combined effect of Midflame Wind Speed and the slope equivalent wind speed in the direction of maximum spread (head fire). 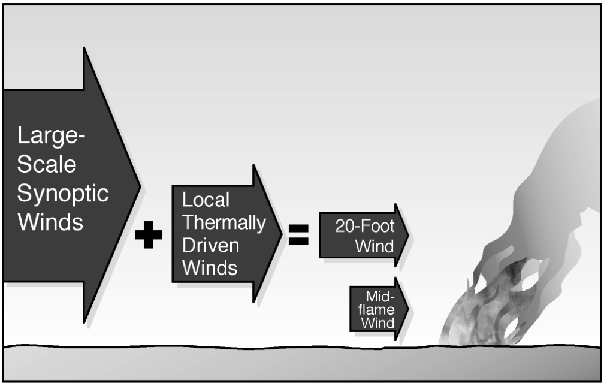 Effective Wind Speed is used in place of midflame wind speed when winds are blowing upslope and to determine size and shape (length-to-width ratio) for those fires. See Section for Effective wind speed. Isolated peaks tend to divert general wind flow horizontally and vertically. Some acceleration of general winds is likely around the flanks and over the top of isolated mountains peaks with gently inclined slopes. On the lee side of the peak, a turbulent reversal or wind eddies of general wind flow is possible. 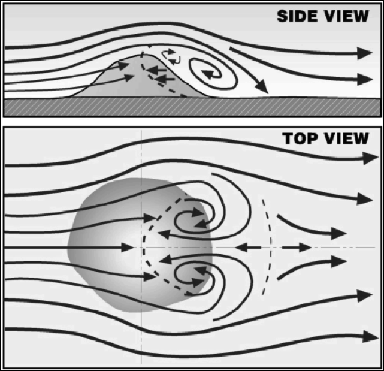 Overall, mesas tend to decelerate general winds because energy must be expended to create local reversals of wind flow called “separation eddies” that form upwind and downwind of steep sided barriers near separation eddies and on top of the mesa, expect 20 feet winds to be decelerated below what might be expected for the general area. Be aware of the potential for frequent gusts and shifts in wind direction near the eddies. Continuous Ridges when airmass is instable, general winds tend to ride over the ridge. Under stable conditions, weak winds are blocked and a stagnant zone formed below the ridges. In either case, the atmospheric stability, the strength of the general wind and its angle of incidence, and influence of diurnal winds (which may be opposing) must be considered on the downwind side of the ridge. 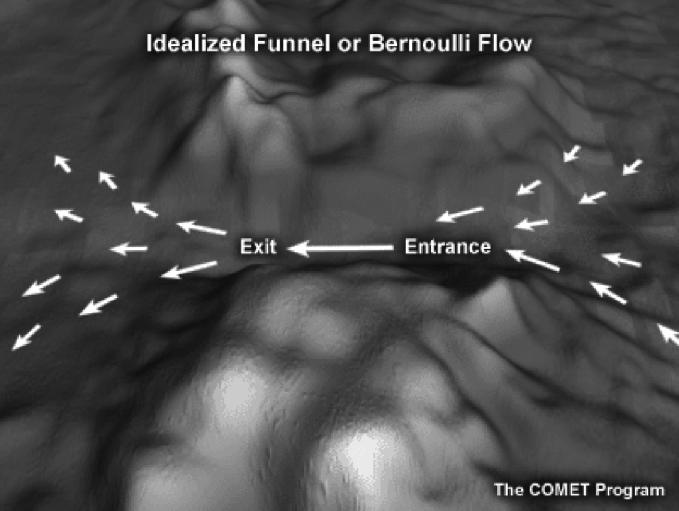 Gaps in Terrain can produce a venturi effect, where winds can be expected to accelerate downwind of the constriction, primarily in the exit region. These gap winds are part of the general wind, because they are based on general winds. Low Level Gorges frequently facilitate gap flow when upwind airmass is stable and discourages the wind from rising over terrain. These gap winds are fairly shallow, less than a few thousand feet. Mountain Passes and Saddles form upper level winds that impact high terrain tend to flow through the lowest possible spots in a mountain chain rather than climb over it. Local slope and valley winds should be included here. The local drainage wind component transitions from upslope as the sun hits the upper slopes, then up-valley as the heating becomes widespread to downslope as the sun sets and down valley during the night. The general wind influence on surface winds in these valleys depends on its strength, the angle of incidence to the valley axis, the depth of the valley, its aspect alignment, and the time of day. During the day, general winds that are aligned with the up-valley wind will increase the surface winds. Opposing winds will result in decreased surface winds. And perpendicular general winds will contribute little to the local winds found there. During the night, general winds are most likely to surface when they are strong and aligned parallel to the valley axis. Enclosed or Isolated Basins have generally reduced surface wind low on the slopes and valley bottoms. Inversions may limit even the infrequent gusts. Forked or Bent River Drainages are even more dominated by local winds, though the relationships are even more complex. In the daytime, look for general winds to surface primarily in several exposed stretches, creating a mosaic of stronger and weaker surface winds, depending on alignment. At night, the situation is simplified with predominately local downslope and down valley breezes. Beware of strong general winds that are aligned with certain sections. Inversions in valleys are very effective at preventing general winds from surfacing on the midslopes or valley floor. Light local slope and valley flow will likely be the dominant winds. Expect to adjust the 20 feet wind downward when an inversion is present. They generally form at night, but may persist through daylight hours if sunlight is diminished by smoke, fog, or cloud cover. Beware that strong general winds at night can dissipate and inversion through turbulent mixing. Foehn winds, barrier jets, downslope windstorms, and cold air avalanches may interact locally with the terrain features discussed above and result in even stronger flows. 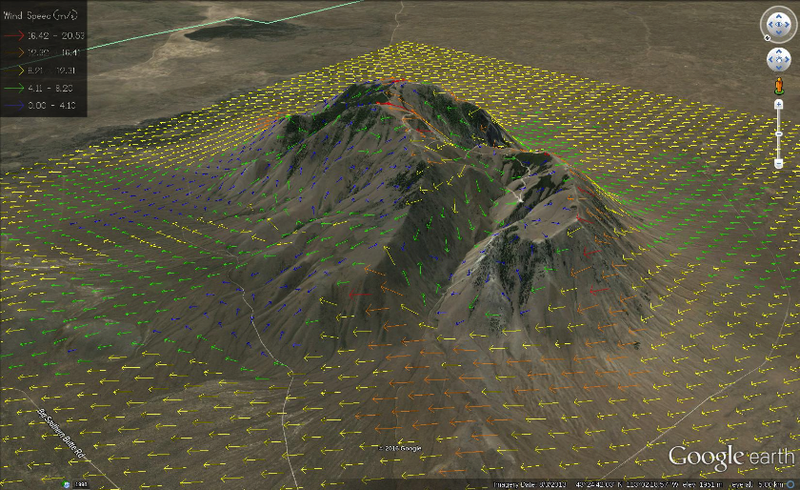 WindNinja is a computer program that computes spatially varying wind fields for wildland fire and other applications requiring high resolution wind prediction in complex terrain. WindNinja can be run in three different modes depending on the application and available inputs. The first mode is a forecast, where WindNinja uses coarser resolution mesoscale weather model data from the US National Weather Service to forecast wind at future times. The second mode uses one or more surface wind measurements to build a wind field for the area. The third mode uses a user-specified average surface wind speed and direction. ArcGIS shapefiles and asci rasters. 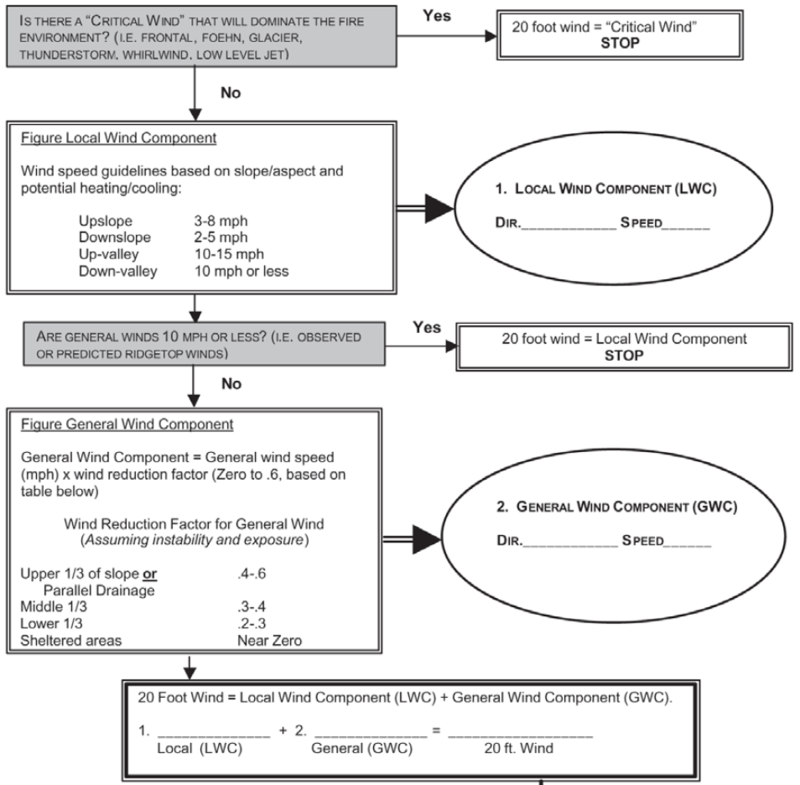 Once general winds are adapted to 20 feet surface winds based on terrain and other local factors, adjustment of 20 feet wind to midflame wind depends on canopy sheltering and surface fuel bed depth. 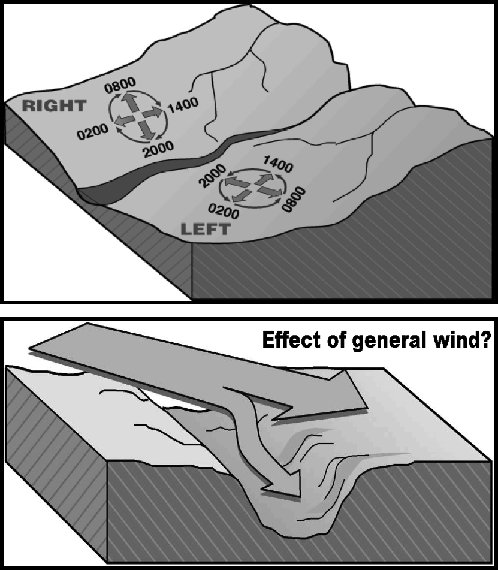 Note how the effect of sheltering varies based on fires position in terrain. All Canopy covers less than 20% and all Crown Ratios less than 0.2 are considered unsheltered. Wind Adjustment Factor (WAF) for unsheltered fuel is a function of fuel bed depth only. WAF for sheltered fuels is based on a combination of Canopy Cover, Canopy Height, and Average Crown Ratio for the site. As combinations of these factors increase, WAF becomes partially sheltered, then fully sheltered. On high ridges where trees offer little shelter from wind. Surface with average Crown Ratio less than 0.2 (crowns less than 20% of tree height) and Canopy Cover less than 20%. Beneath canopy at midslope or higher with wind blowing directly at the slope. Under standing timber on flat or gentle slope. Under standing timber near base of mountain with steep slopes above.